If you look at the box, the outside sleeve has the word iPod in Apples Garamond serif typeface. On the top you see the inner box with the apple logo in white. On the bottom there is a sticker with part number and serial number. The colors of the sleeve are white, black and gray and the clamshell box that holds the iPod and accessories is silver. There is NO text about the hard drive size, NO orange color, NO text about Mac or Windows and most definitely NO pictures of artists. The inside compartment is made of white styrofoam. 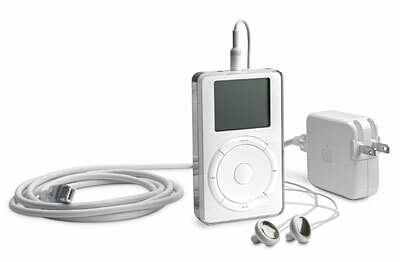 When you open the box up, the iPod rests in a recessed slot to the right under the silver cover flap with the text iPod in white. To the left you find an apple logo in white on the silver envelope with the CD and paperwork that covers the accessories. The iPod is wrapped in transparent cellophane plastic with the words “Don’t steal music” in english, french, german and japanese. In the slot under the iPod you find the headphones and one set of lightgray foam pieces in a sealed silver envelope. I have no source to make me absolutely sure this was the original place for the headphones in the box. To the left there are three slots for accessories. In the top left slot there was a silver paper flap to cover up the empty slot. My guess is that this slot was used for different pluggs to the power adapter when sold in other parts of the world, but I haven’t been able to confirm this. The lower left slot is for the power adapter which was also wrapped in transparent cellophane. In the right slot you found the FireWire cable. It was neatly wrapped in a figure eight and hold together with a white plastic coated metal wire. It was also wrapped in thin plastic with a perforation to make it easy to tear open. Both ends of the cable was also covered in thin transparent plastic sleeves. My guess is that less than 200 000 iPods were made and sold worldwide of the first generation. From November 10 to December 31 roughly 125 000 units were shipped. And I know of less than 10 pieces in the world that are unopened and still shrink wrapped from the factory in Taiwan. A piece like that can easily fetch a couple of thousands dollars on ebay. A used iPod in good condition with the original box (matching serial numbers) and the original accessories could also be interesting to many collectors. Do not expect to become millionaires like some sellers though. Thats just ridiculous.